It’s customary on Tu B’Shevat, Judaism’s new year for trees, to eat a new fruit or to eat from the seven species described in the Bible as being abundant in the land of Israel. With the holiday quickly approaching, I am testing out some of my recipes that feature these sacred fruits; wheat, barley, grapes, figs, pomegranates, olives, and dates. While recipes which include only of these items abound, I only have one concoction which incorporates them all, I call it Lava Bread. I invented this bread a few years ago when looking for a way to spruce up my standard challah. I added one more ingredient each week, testing the change on my family. The wheat and barley were easy additions. Whole wheat flour was already in my standard challah. A sprinkle of toasted barley pearls on top added a nice nutty crunch. 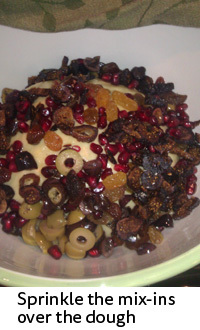 And while raisins also are a standard in bread, figs, pomegranates, and dates were new to me. The fruity additions were welcomed by my four year old and his father alike. There was a small amount of resistance to the olives, but the salty contradiction to sweetness is better than you might think. 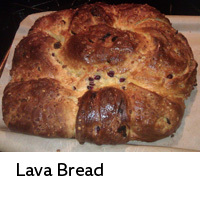 I called it Lava Bread because it consumes everything you add to it, much the way that magma consumes all in its path. While there are many sweet elements, I consider this to be a savory bread, perfect to serve beside a yummy roast chicken and a side of roasted brussels sprouts. Celebrating this holiday helps remind our family how important trees are to all of us. I read a comic strip the other day that said “It’s too bad trees don’t put out wifi, we would plant them everywhere. Instead, they only produce oxygen.” I think this is a perfect example of how trees and the work they do is taken for granted by so many. Put ½ cup of dry barley pearls into a bowl with 1 ½ cups boiling water. Cover and set aside. Mix 1/4 cup warm (110 degree) water with 1 package yeast and 1 packet of sugar (1 tsp) in a small bowl. In a large bowl, mix 1 1/4 cups warm water with 3 egg yolks, 1 whole egg, 1/2 c honey, 2 tbsp. veggie oil, and 2 tsp. salt. The warm water will help dissolve the honey. Once this mixture is completely homogenous, add the yeast mixture and stir to combine. Now mix in 1/2 cup whole wheat flour. I find a wisk works best to ensure this is evenly distributed. Next, add bread flour*, 1 cup at a time, mixing thoroughly with each addition until you have added 4- 6 cups (this depends on the humidity that particular day). You will know when you’ve added enough when you can pinch the dough and it doesn’t stick to your fingers. *Bread flour is higher in protein, which improves the texture of the bread. AP flour will work if you don’t have the Bread flour, ditto for the whole wheat flour. Dump this mixture out on to a well-floured surface and fill your bowl with warm water. Put a small pan of water on the stove and bring to a boil. While you wait for the water to boil, knead dough to incorporate another 1/2 cup of flour. Form into a ball. Wash your bowl (should be very quick, since you filled it with warm water a little while ago) with hot water and dry well. Now coat the inside of the bowl with veg oil and place the dough ball inside, turning to coat. Cover the bowl of dough with a tea towel that has been wet with hot water and wrung out. Place the bowl and the pan of hot water side by side in your oven, with the oven off. While beginning to rise (25 minutes), prep your other mix-ins. When the 25 minutes is up, pull back the towel and sprinkle the mix-ins over the dough. Re-cover and return to the oven for another 25 minutes. 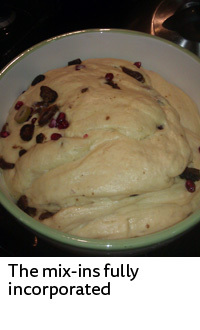 During this time, about 15% of the mix-ins will begin to sink in to the dough. Now pour the dough and mix-ins remaining on top back onto your well-floured board. Be sure to flour your hands well, and then knead 1-2 minutes to incorporate the rest of the mix-ins into the dough. While you’re kneading, re-heat your water. Return dough to bowl with re-warmed and wrung towel, and place it back into the oven with the reheated pan of water. Pour onto floured bowl again and knead 3-5 minutes, adding flour as needed, so dough isn’t too sticky. Now you are ready to braid. I like to keep it simple and just do a 6 part weave, but you can do whatever style you like. Place onto parchment paper and brush with egg wash (1 egg + tblsp water). Rise for the last time, 35-40 minutes on the counter. The rising is done when the dough doesn’t bounce back when you touch it, but gets an indention instead. Heat your oven to 350 degrees about 10 minutes BEFORE you dough is done rising. Place the challah into the oven for 20 minutes. Pull out and coat again with egg wash. This ensures all the crust is nice and brown. Sprinkle on the barley pearls and a generous pinch of kosher salt. Spin so the side that was in the front of the oven is now in the back of the oven and return to the oven. Cook another 20-25 minutes, or until it sounds hollow when you tap it. Allow to cool completely, then slice and enjoy! Which came first, the pomegranate or the cranberry?